Best Friends always find time to keep in touch and share there personal achievements. 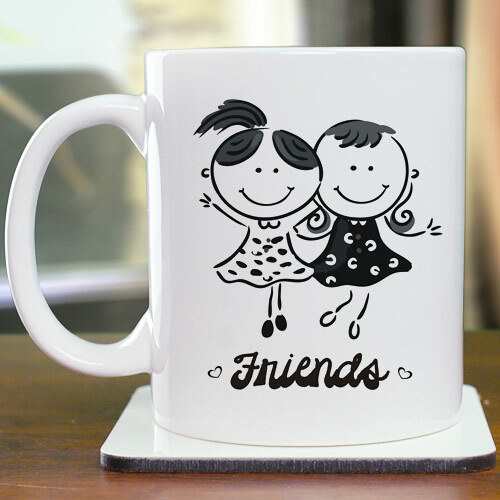 Give your best friend this beautifully crafted Best Friends Coffee Mug to use when you see one another. Your Best Friends Coffee Mug is Dishwasher and Microwave safe, and holds 11 ounces. Happy Friends on one side and the other side reads: Your friendship brightens my day with fond memories of the past and whimsical hopes for the future. I’m so lucky to have a friend like you. I was very satisfied. Was glad to see the writing on the other side. Very nice. Additional Details Shop GiftsForYouNow.com for all your Personalized Friend Gifts. We have the right Friend Gifts at very affordable prices every day. So when you need a Personalized Gift for Friendship Day we are here to help.